December 31, 2009 - Salzburg, Austria – In order to join the elite group of pilots who compete in the Red Bull Air Race, potential candidates must complete a rigorous qualification process which ensures only those who are completely ready for the challenge are awarded the prestigious Super License. With the conclusion of the 2009 Red Bull Air Race season and a new world champion, the focus moves to the new pilots who will enter the ranks next year. Adilson Kindlemann, 36, from Brazil and Czech pilot Martin Sonka, 31, both add their names to the growing list of top class pilots who have qualified to race in the world’s fastest motorsport. The two pilots were awarded the Super License after proving their worth at the week-long Red Bull Air Race Qualification Camp at Casarrubios, just outside Madrid in Spain this October and recently received confirmation that they both have a seat to race in 2010. Kindlemann, a current airline pilot with over 11,000 flight hours in his logbook, lives south of Rio de Janeiro in Curitiba. The Brazilian had his first flight at 15 and has been hooked ever since, taking on aeroplane maintenance jobs while studying for his commercial pilot’s license. He says working towards becoming a race pilot has been his main focus since the 2007 race in Rio de Janeiro, where he displayed in front of 1 million spectators as part of the side act programme. Kindlemann has been building up to this moment since he first witnessed the competition. Outstanding achievements in international flying competitions are a prerequisite to obtaining the elusive Super License but pilots must also be comfortable handling high performance aircraft at low level in front of crowds. It’s the combination of these two areas of experience that make a great race pilot. Precision is essential to make it through the aerial race tracks without incurring penalties but a safe approach to flying in close proximity to buildings, bridges and people is absolutely vital. Even the most skilled pilots can be denied the coveted Super License if they are not totally comfortable in this environment. Following the retirement of American Mike Mangold and South African Glen Dell from the Red Bull Air Race at the end of the 2009 season, the two new pilots will bring the total to 15 pilots competing in 2010. Kindlemann and Sonka will be up against current World Champion Paul Bonhomme (GBR), Hannes Arch (AUT), Matt Hall (AUS), Kirby Chambliss (USA), Nicolas Ivanoff (FRA), Nigel Lamb (GBR), Peter Besenyei (HUN), Matthias Dolderer (GER), Michael Goulian (USA), Sergey Rakhmanin (RUS), Alejandro Maclean (ESP), Yoshi Muroya (JPN) and Pete McLeod (CAN). 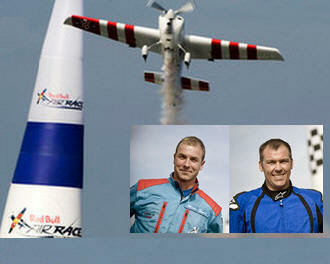 The Red Bull Air Race World Championship will touch down in familiar as well as new and spectacular locations in 2010. The full race calendar will be announced in the New Year.